Innovative new technique to survey streams – higher quality, quicker and less expensive! Through the use of a combination of GPS, video, depth, and water chemistry sensors, it is now feasible to survey 15 miles of stream in a single day with data collected every meter. This multi-attribute data collection technique has the ability to change the thin blue line representing your stream on a GIS layer to a high resolution habitat layer. The range of data collected is highly useful for GIS mapping, modeling, and habitat identification applications. As fisheries professionals, we use habitat use, availability, and suitability models as the basis for response to many management issues. Most of these models are based on habitat descriptions of short (several 100m) sections of stream or rivers. We distribute the field sites in various places within a stream or among streams and then extrapolate the conditions to represent a large portion of the stream system. It is typical to have direct field measurement on less than 5% (and in many cases < 1%) of the overall stream miles in a management area. For example, in the 2006 Wadeable Streams Assessment, the EPA estimated that there are 671,051 wadeable stream miles in the lower 48 states. Their assessment used 1392 sites distributed across the country. If each site characterized habitat in a 1 mile section (a large overestimation) then their direct field measurement was approximately 0.2% of the total stream miles. The new multi-attribute geovideo mapping system greatly improves the ability of surveyors to accurately map habitat over long streaches of streams. Dr. Paul Ayers, a biosystems engineering professor, at the University of Tennessee began the development of a georeferenced video mapping platform over 10 years ago. Over time and with the collaboration of colleagues and students, the technology, process, and validation of the techniques have advanced greatly. More recently, in conjunction with TRUTTA Environmental Solutions, Inc. this prototype technology is being standardized to directly support fisheries and habitat quality assessments. Right and left shoreline conditions, such as, bank height, bank angle, bank stability and erodibility, surface protection, riparian diversity, legacy trees, woody debris, bankfull level, docks, boat ramps, bridges, power line crossings, pipes, and point source and non-point source pollution locations. Stream conditions, such as, habitat type (pool/riffle/run), stream width, depth, velocity classes, substrate, embeddedness, channel rugosity, cover, location of barriers, sinuosity, and slope. Greatly improve resolution of habitat suitability models and allow integration with models like PHABSIM and Mesohabsim. Support the EPA wadeable stream habitat assessment approach. Provide broad coverage for habitat quality in IBI type assessments. Delineate Threatened and Endangered species habitat and find locations of optimum habitat for reintroduction. Help identify and prioritize restoration areas to increase the cost effectiveness of restoration efforts. Apply Bank Erosion Susceptibility Index (BESI) scores to support the EPA Watershed Assessment of River Stability & Sediment Supply (WARSSS) methods. Compare habitat conditions in different rivers as well as shows annual trends for the same river to see if river health is improving or declining. Assess habitat connectivity and proximity to look at habitat distribution over a range of seasons or flow conditions. Provide a permanent database of stream conditions that is reviewable in meetings to show actual conditions to all participants (as opposed to trying to get everyone in the field). Collect information in both cross-sectional and river thalweg profiles. 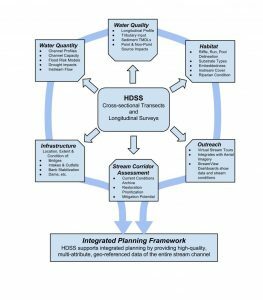 The application of the HDSS data to multiple different water management issues and its use in an integrated planning framework. In addition to streamlining both the shoreline and instream habitat surveying methods, some upcoming plans include an effort to combine video techniques with side-scan sonar (like Keaser and Litts methods) to create even more habitat classification abilities. Also, we are working with different water quality testing sensors to collect this information at high frequency during the stream surveys. 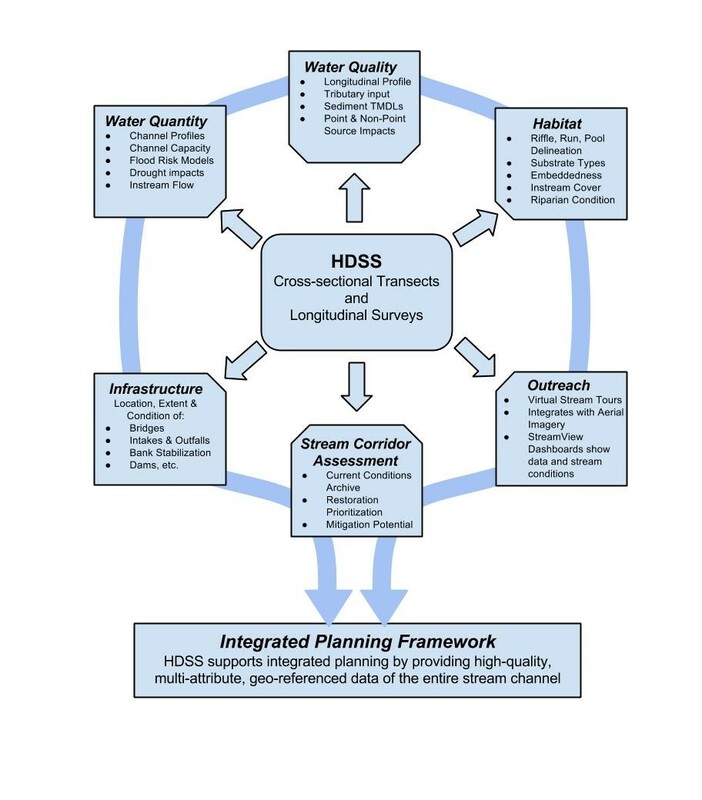 Overall, we feel this approach can rapidly and cost effectively transform the data poor stream lines into multi-attribute, high resolution habitat maps. This will allow managers to move from statistical assumptions about the “average condition” of a stream based on a few small samples to a census of conditions with highly accurate, site specific data available.